I decided to experiment the other day. It actually started with a reader of mine. She asked me how to stencil on a door mat. I said simply the same way you would stencil anything else. 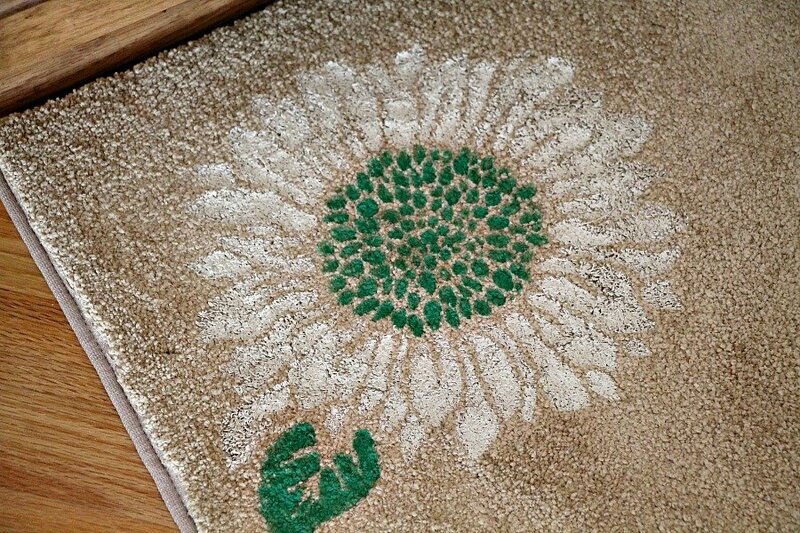 However, I never tried stenciling on a rug. I have stenciled on a bamboo mat years ago and that did indeed work. 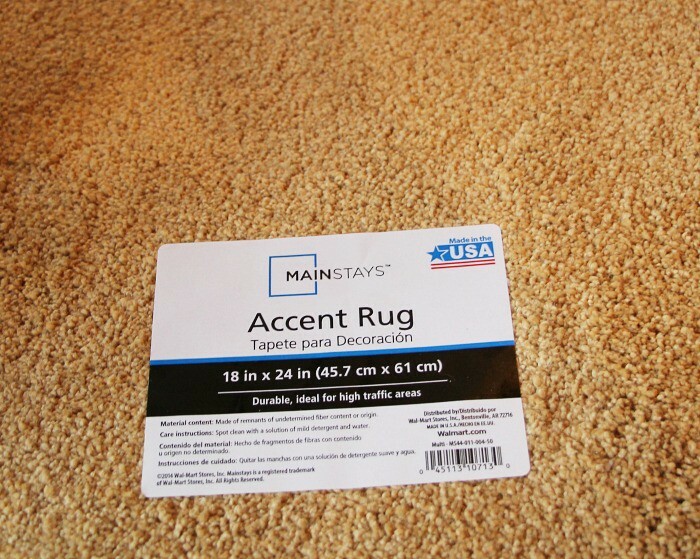 I picked up a few cheapo remnant rugs from Walmart. They were a whopping $1.88. I figured I had not much to lose if they did not work out. I did this experiment live on facebook. I was seriously sweating bullets. I thought to myself if this doesn’t work, oh boy would I look foolish. A chance I was willing to take, because quite frankly, I can laugh at myself as I do often. This is nothing to take too seriously in life. A failed project is a failed project. You just try again or move onto to something else. I won’t jibber jabber too much in this post as I am leaving the live experiment video down below for you. and the other a sunflower stencil I found online. I believe it was Jo-Ann fabrics. I did however find another similar one on Amazon and will leave my affiliate link below. The paint did dry nicely and is somewhat crunchy in those areas. I sprayed the adhesive spray over it lightly once all the paint was completely dry. I waited until the next day to do that. Believe it or not, I was patient. A reader just recommended scotch guard. DUH! Why didn’t I think of that? I just so happen to have a can under that sink. I have another remnant as I mentioned, but I think I am holding off on that one. I have other plans in mind. Waverly craft paint (found at Walmart) I think any craft paint or chalky paint would work. Definitely a success and looks great too. What a nice project, Debbie! I have often wondered if something like this would work, and am happy to see that it does. Thanks for sharing! I believe you can do anything if you put your mind to it! You did it! This DIY was a success! I love the look. Thanks for sharing this awesome project! 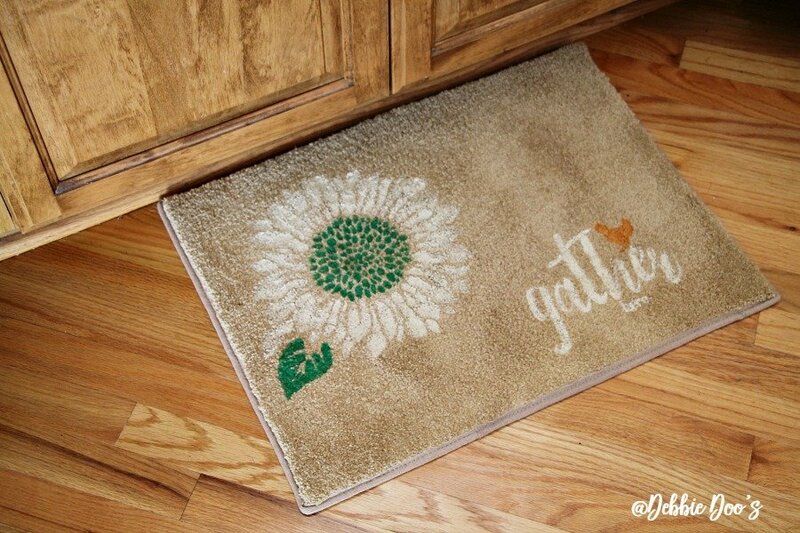 How cute,could do an outside mat ? 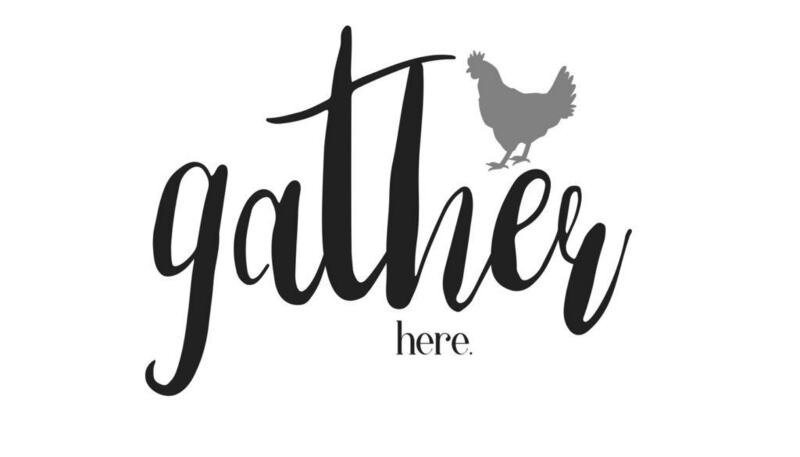 Going to order your gather stencil,love it. I really like that. 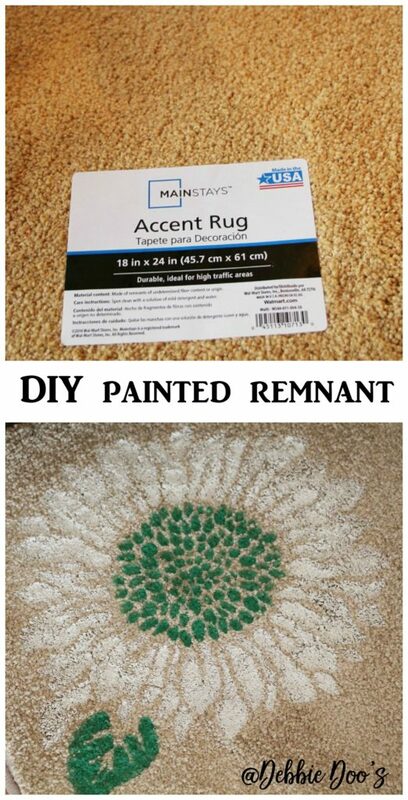 It is such an improvement from must a plain rug and special because it is your own design. It is something I might try in the future. 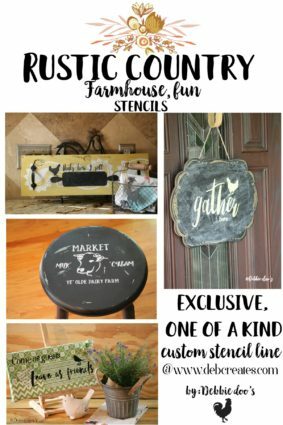 I have already gotten your “Market Day” stencil and plan to order the “Gather” one soon. I actually did these in the late ’80’s… and sold them… I used acrylics mixed with gel medium and the paint wasn’t as “crunchy”! I love yours, awesome stencils! Such a fun, budget-conscious idea! Looks beautiful, Debbie! Wow!…What a great project..you nailed it Debbie…and you cannot beat the price!! What a great idea Debbie! Very creative, decorative, and useful! Thanks for sharing! I love how you ‘just go for it’; if it works that’s great and if it doesn’t…..ok well, learn and laugh about it. 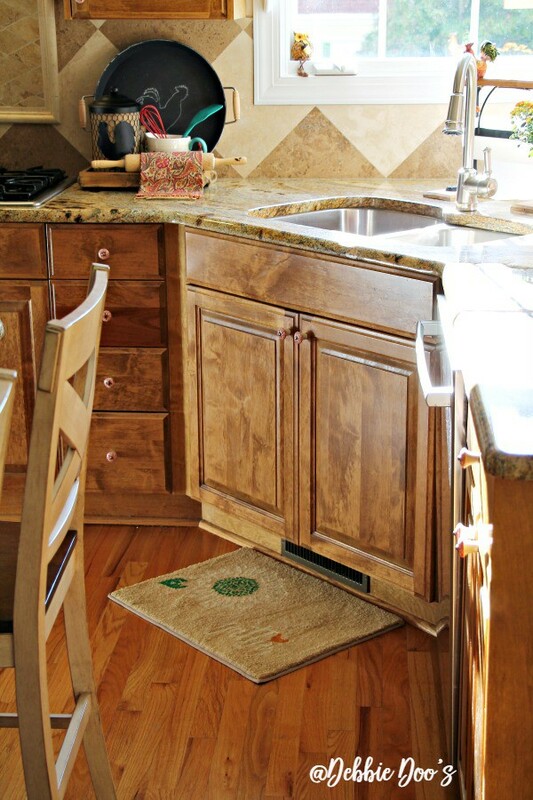 This project definetly worked; the rug looks fantastic. Great job Debbie.